To celebrate its ongoing partnership with Audi Fashion Festival Singapore (14-18 May) , kikki.K has collaborated with students at LASALLE College of the Arts to bring bespoke fashion designs to life. Judged by Kristina, the two winning designs will be showcased throughout the festival in a bespoke window display at our flagship store at ION Orchard from May 8, and on site at the Audi Fashion Festival tent from May 14. Here is just a selection of some of the amazing inspiration and concepts that started the unique designs we’ll be showcasing later in the week. Our new Homewares Collection features beautiful pieces for your everyday. These gorgeous porcelain Canisters are pretty, practical and perfect for any space. Discover how to use them in three unique ways and brighten up your home with the warmth of wood and subtle gold. 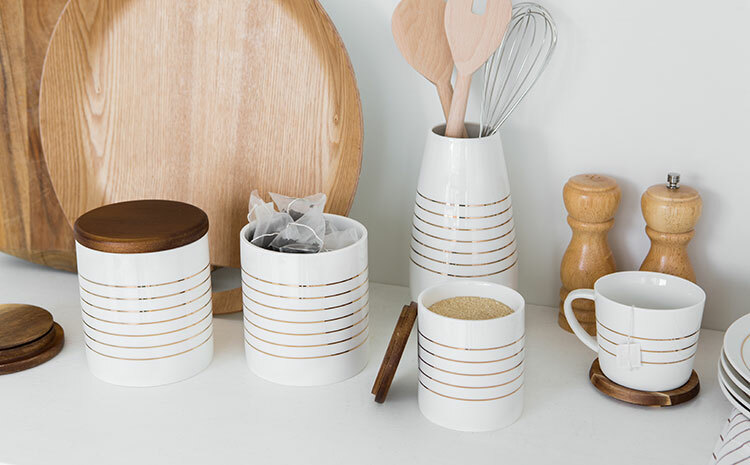 With removable plastic sealers, these beautiful Canisters are perfect for storing kitchen essentials like your favourite tea, coffee, sugar, spices and more. The simple and sophisticated colours work back with any colour scheme, especially when teamed with wooden chopping boards, platters and accessories. Tip: Use the porcelain Vase to hold everyday kitchen tools for stylish storage and easy reach in the midst of cooking. 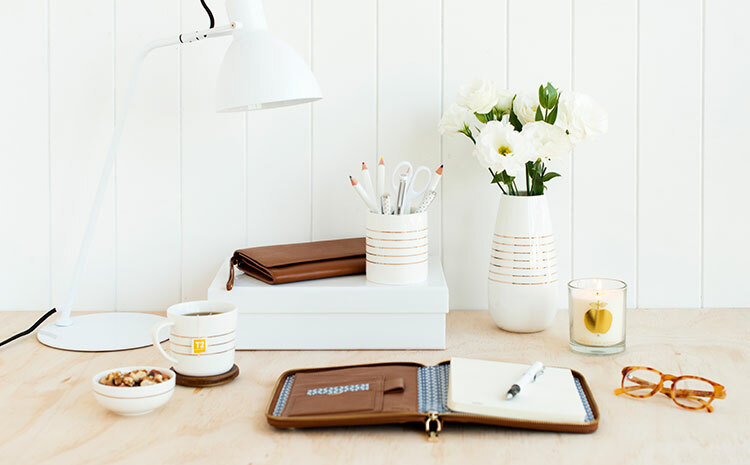 Whether you work from home or the office, organise your desk accessories in style with these handy Canisters. Choose from the 10.5cm or 13.5cm Canister to keep pens, pencils, scissors and more in one convenient spot. All you need is some fresh flowers and a hot cup of tea to say hello to an inspired and productive workspace. 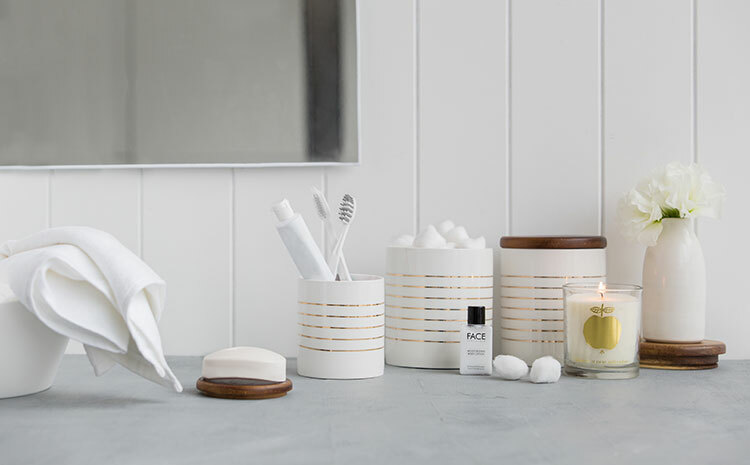 These stylish Canisters will add beautiful warmth to an otherwise cool bathroom. Use them to store toiletries and bits and pieces such as cotton balls, makeup, toothbrushes and more. Don’t forget to light a delicious Scented Candle to create a relaxed and warm atmosphere you’ll love. What’s your favourite look? How would you use yours? We’d love to know. Shout out below and share your styling tips! We are so excited to see the final result of our RMIT x kikki.K Collaboration, just in time for VAMFF which runs from 17th – 23rd March. Each winning design was brought to life in the windows of our kikki.K Chadstone boutique. These wonderful designs are the work of Natalie Kieleithner (cape), Ally Li (dress), and Evaleen Motoska (shirt and trousers) – students of the School of Fashion and Textiles at RMIT. Not only showing off their talented work, the windows and store displayed the inspiration, process and details of each student’s work. We’re loving these unique fashion designs, inspired by our new season Uppsala Collection. If you get a chance, be sure to pop in at kikki.K Chadstone to catch a glimpse of these wonderful pieces before the end of VAMFF. To launch our new and upcoming collections, Kristina hosted an intimate gathering over a traditional Swedish ‘Fika’ (roughly translating to ‘coffee break’) with some special media guests in Sydney last week. Held at the Fika Swedish Kitchen in Manly, the delicious spread included Cinnamon Buns, Semlor, Choc-Oat Balls and Kladdkaka accompanied with tea and coffee. Kristina spoke about her inspiring journey starting kikki.K and the important of dreaming, especially in the very beginning. Guests were asked to write down a dream in their kikki.K 101 Dreams Journals and share them with each other. Sneaking a peek at exciting new collections and taking home a stylish kraft Storage Box filled with kikki.K goodies, guests were treated to a celebration of all things Swedish and kikki.K on a gorgeous sunny morning. View new collections coming soon here.